Apple Store ‘Red Friday’ Sale Is On Now! One Day Only! In conjunction with the arrival of the Lunar New Year, Apple is currently having this ONE-DAY ONLY ‘Red Friday’ sale for countries like China, Hong Kong, Taiwan, Singapore, Malaysia, Thailand and the Philippines. So if you’ve been thinking to buy an iPad or Macbook Pro or even just a Magic Trackpad, now is the time! 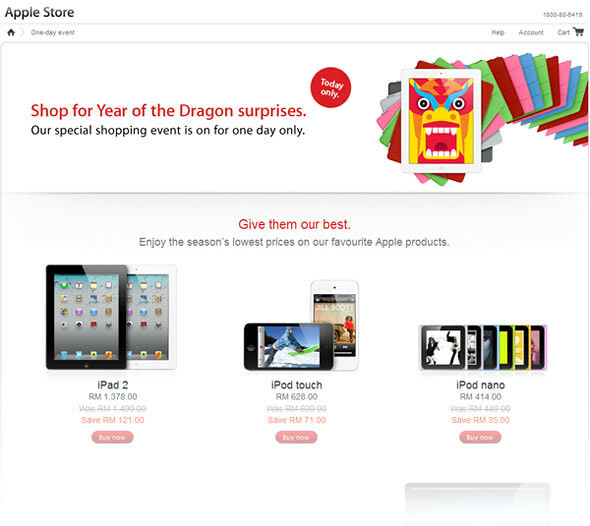 Click here to go to the Malaysia Apple Online Store today!